As you know, when it comes to gear, we review backpacks the most. Upon reviewing tens of most popular backpacks in 2018, we found that Osprey Aura AG 65 is the women's best backpacking backpack. For this comparison, Aura AG 65 and Ariel AG 65 are decided to be compared since they're the best products of their particular series. 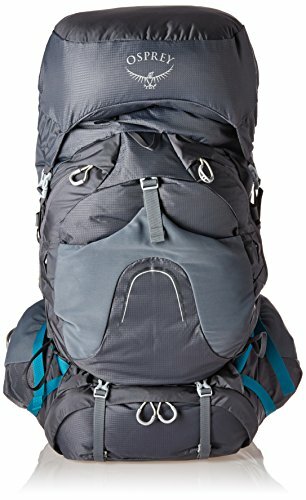 Osprey Aura AG 65 | from $201.95 scores 88/100 and is women's best backpacking backpack we tested. Adjustable AG (AntiGravity) Backpanel Suspension System feels exceptionally comfortable and keeps your back more ventilated than other women's backpacks. Many exterior and interior pockets allow organizing your items and have most of them readily available. Lightweight structure and excellent tool attachment capability adds to Osprey Aura AG 65 versatility and makes it convenient for any outdoor activity. We've been buying backpacks online for years and never had any problems. Before you buy, do make sure to check the seller's return policy, but you can you can almost always return an unused pack within a certain time frame and you're good. If it doesn't fit quite right after trying it on at home, you can always return! However, if you're planning to participate 5+ days of heavy hauling outdoor adventures mostly, Osprey Ariel AG 65 | from $239.00 becomes a better option because of its bulkier suspension system and rich features such as convertible top lid daypack and front access to main compartment. Dimensions: 29.53H X 14.96W X 15.75D IN. See our men's Osprey Atmos AG 65 vs Aether AG 70 comparison! Aura AG and Ariel AG packs being sold inside and outside US stores are different. For online purchases, you should always read the product description regardless of the whereabouts of retailer. Removable raincover is contained inside the upper top lid zippered pocket in both products. We found Osprey Aura AG 65 to be the women's best backpacking backpack. Excellent all purpose design makes Aura AG 65 perfect for any outdoor activity with both heavy and light loads. Through state-of-the-art Anti-Gravity suspension system and exceptional hip belt and harness adjustability, it provides the best customized fit, perfect comfort and incredible ventilation. 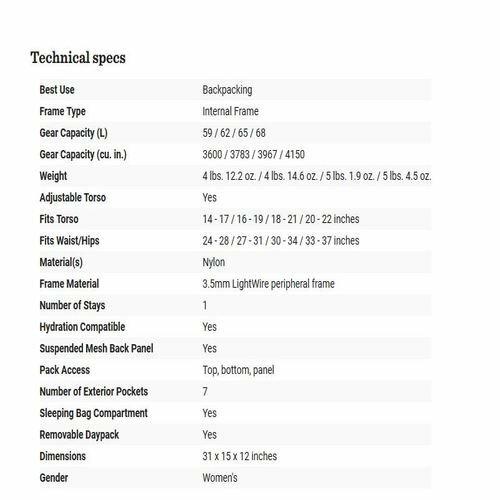 Structure of Osprey Ariel AG 65 is bulkier. It has a burly suspension system and a very thick and sturdy hip belt. I know that it kind of sounds undesirable, especially in terms of weight, and I don't disagree. But it qualifies with heavier loads. If you're planning hiking/camping trips mostly with your children, heavy loads or during winter, Ariel AG 65 will definitely make you feel more comfortable. Another area that Ariel AG 65 prevails against Aura AG 65 is overall organization and features. Unique convertible top lid daypack and J-Zip front access to main compartment prove the extended trip/heavy load design intention of Ariel AG 65. Before I get down to the nitty gritty, I'd like to remove a popular confusion about these products. Anti-Gravity suspension systems of Aura AG and Ariel AG aren't the only upgrade to previous Aura and Ariel (without the AG's) models. Don't use the information given in this article to decide between previous models. Aura AG and Ariel AG are Osprey's women's specific backpacking backpacks. Aura AG Series offer two different options with 50 and 65 liters while Ariel AG Series offer 55 and 65 liters, and hence the names. Different volumes mean different products. Don’t use the information given in this article for Aura AG 50 or Ariel AG 55 backpacks. We found that larger volume models are superior, -a more detailed post about this later-, so we're comparing 65 liters models of both products. Men's specific counterparts to the Aura AG and Ariel AG series are Atmos AG and Aether AG respectively. If you're looking for Atmos AG vs Aether AG comparison, see our related post. Quick difference: Heavy, bulky back panel of Ariel AG 65 performs better with heavier loads. Aura AG 65 provides exceptional ventilation with lighter, more flexible and versatile back panel. Both backpacks are supported with the anti-gravity suspension system, which is the latest suspension technology of Osprey. AG backpanels of Aura AG 65 (left) and Ariel AG 65 (right). They're covered by a mesh foam and generous thick padding reaching from the very top all the way down to the hip belt. Design intention of AG system is to make you feel like you're not even wearing the pack. AG suspension system close-up (photo belongs to Osprey Aura AG). Comfort: AG backpanel conveys the majority of weight to your hips, which are the largest muscles in human body as explained by Library of Congress in 2017. This way you're kept less exhausted and able to walk longer distances more comfortable, as proven by the study of Epstein et. al. concluded in 2017. Ventilation: Air flow between your back and the backpanel is increased with AG system. Aura AG 65 provides incredible ventilation. Ventilation of Ariel AG 65 is legit but not as good as Ariel AG 65. Stability: Your load and the backpack is stabilized by keeping them close to your body through AG suspension. Stability of Ariel AG 65 is superior with heavier loads but lacks with lighter loads. On the other hand, Aura AG 65 provides equally well stability regardless of load variance. Women's specific customized seamless fit (photo belongs to Osprey Aura AG). In short, back panel of Ariel AG 65 is bulkier, and actually a little too bulky to perform as good as Aura AG 65 with lighter loads. However, both packs promise to keep you less exhausted and sweaty along the way. ​Shoulder straps are equipped with innovative adjustable stiffeners at the load lifter portion. Since the stiffeners are adjusted after wearing the pack, the better fit is achieved and hence the more load is mitigated from your shoulders. Thickness, padding and seams are very decent in both products. Straps of both packs are very thick and well padded. Another thing worth mentioning is that besides the inner surface of the straps, seams reach to the outer surface as well (shown in red box - available in both products). This way it's completely ensured that the straps won't chafe your shoulders. Quick difference: Hip belt of Aura AG 65 is adjusted easier, has better bodyweight change adaptability and results in perfect fit. Thicker and more sturdy hip belt of Ariel AG 65 performs better with heavier loads only. Two different innovative approaches are followed by Osprey for these products. Fit-on-the-fly hip belt of Aura AG 65 is adjusted by pulling the lid inside the hip-belt after wearing the pack, which always makes the adjustment better and easier. Osprey Aura AG 65 Fit-on-the-fly hip belt adjustment. Hip belt of Ariel AG 65 is adjusted by visiting an Osprey dealer where an Osprey oven is available. They heat the hip-belt there and mold it to your hip. For online purchases, custom heat molding is serviced in a local CM Certified Dealer anywhere near you upon paying extra cost. Honestly, any hip belt is molded to your waist naturally. Molding process only speeds up the progress, so you don't have to worry about drastic bodyweight/waist size changes. Plus, you can remold the belt up to 3 times. Hip belt of Ariel AG 65 is thicker and more sturdy, which is why Ariel AG 65 performs so well with heavy loads. I don't have any problems with Ariel AG 65 hip belt, as it's pretty much above the market standards. It's just that hip belt of Aura AG 65 works so well it's difficult to compare any other pack with it. The only gripe we had with these belts is that they both squeak fairly while walking with them. To us, that's tolerable. Quick difference: Unlike Aura AG 65, Ariel AG 65 comes with a convertible daypack in US/raincover in EU and a J-Zip front access to main compartment. Aura AG 65 has 6 zippered and 3 unenclosed pockets, Ariel AG 65 has 5 zippered and 3 unenclosed pockets. Both packs are internal frame top-loading designs. Unlike Aura AG 65, Ariel AG 65 offers an additional entrance to the main compartment from front. It's not an ordinary feature and makes all your items readily available. You don't have to dig through your equipment to reach an item stuck at the center. Sure you can pack your items considering the frequency of use, but it's still a premium and very useful feature to have. A mesh unenclosed pocket (pouch) at the front surface is offered in both products. They offer plenty of room and usually utilized for storing wet, smelly or dirty items to keep them away from your inner drier equipment. Photo belongs to Osprey Aura AG. Sleeping bag compartment is larger than a bear canister and is separated from the main compartment by a removable divider in both products. Top lids of both packs are floating type, meaning that you can remove them or shift them upwards to accept overloading. When removed for lighter use, FlapJacket covers the top entrance and is buckled to the front surface. Because of convertible daypacks of other brands, I was biased against the daypack of Ariel/Aether AG Series to be poor at first. But when you remove the top lid, unzip the compartment at the top and reveal the shoulder straps inside this lid turns into a completely legit daypack that you can use perfectly for any daily activity. It has two compartments and a gear loop - and it's even hydration compatible! Raincover is attached inside the top lid compartment and is removable. It's possible to attach a Daylite Daypack to Ariel AG 65, but not to Aura AG 65. Hip belt pockets are larger than smartphones and are useful to store frequently used items such as your phone, snacks, sunscreen etc. 2 zippered pockets at the front of Aura AG 65 reach all the way down and offerplenty of room. In addition to standardized vertical installation, horizontal installation option offered in both packs makes storing your water bottle while wearing them very easy. Higher upper installation borders in Ariel AG 65 lead to deeper pockets. You can use the small loop below to reach and widen the mesh pockets for easier installation. Also you can collaborate these mesh holders with upper (and maybe also lower) compression straps for a secure external gear attachment. While packing light, burly suspension system of Ariel AG requires compression from multiple angles to prevent wobbling and decrease comfort, so it's well thought to add extra front compression straps. Although volume does change with size, sizes aren't a choice of volume and shouldn't be regarded as such. You should choose the size that corresponds to your torso height in chart below. Click on image to enlarge. Find Aura AG and Ariel AG on 3rd and 4th rows. Using Osprey’s very own Size & Fit article , you can evaluate your torso length at home. Osprey offers All Mighty Guarantee. Although I'm pretty sure you'll experience zero problems with both packs, it's good to know you're safe anyway. Aura AG 65 (left) comes with an internal hydration sleeve and Ariel AG 65 (right) comes with an external hydration sleeve behind the harness. As opposed to internal hydration sleeves, external hydration sleeves don't make you unpack when replenishing and there's no spilling risk when overpacked. Dual ice tool loops provide tol attachment at the front of the packs with bungee tie-offs. Challanger Blue, Gamma Red and Vestal Grey colors are available in Aura AG 65. Picante Red, Boothbay Grey and Tidal Blue colors are available in Ariel AG 65. We think that most backpackers are better with the Aura AG 65. It's exceptionally comfortable and more adaptable to a very wide range of outdoor activities with different loads. Ariel AG 65 is a more heavy hauling pack. If you'll be hiking with heavy weights most of the time, which means either you'll be hiking for very long (5+ days), with kids or during the winter; choose Ariel AG 65.